Abri-Flex Level 2 is Abena's full range of modern pull-ups that can be worn like normal underwear. Abri-Flex has more elastic Lycra threads, which provides a firm and comfortable body fit and stays in place for active use. 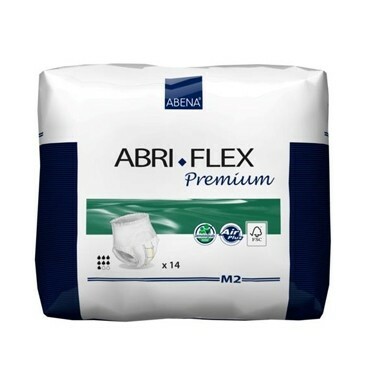 Abena's Abri-Flex range offer a discreet pull-up pant with Abena quality features of softness, top-dry system, breathability and leakage security. Super soft non-woven material ensuring optimum comfort and the feeling of normal underwear. Unique top-dry system provides a dry surface and rapid absorption. Secure modern fit with high barriers and latex-free elastication. Odor system reduces the risk of unpleasant odors. Still living in my own home. Keeps me dry throughout the day. What can I say, the product works as described. For me it works even better with a small amount of talcum squirted inside the underwear prior to actually putting it on. Pros:I have worn one for up to 12 hours with out the elastic giving out but I think that is pushing the limit a bit. Strangely enough I like the fit and feel of these even more than standard underwear in my size. Cons:Occasionally a little scratchy where the seams of the waist band is heat welded together. I find that I soon am able to ignore this on the rare occasions when it happens. Works as expected, does it's job. With this being a pull-up product with NO tabs to deal with it is easy to put on, but only if you are mobile. Strange as it sounds I like the feel and fit of these better than regular cloth underwear. Pros:Front to back can be easily identified by the only piece of small peal-and-stick tape on the back that is used only when rolling up a used item. These are comfortable but the elastic top on mine tend to be visible above the top of my jeans or shorts unless I roll the top edge down for an inch or two. This is not really a problem and the extra grip afforded by the extra material at the top helps retain the underwear in place, so all in all it is still a positive. I keep two or three of these stored individually in 1 gallon storage bags behind the seat of my truck in case I have problems while out and about or when driving for an extended distance. Cons:These can be slightly difficult to get opened for use at first but the problem goes way with more experience with the product. The absorption on this product is only fair, not what I expected. Good for short time use, not for long duration protection.